Following on from the first of the images from the Kensingtons published yesterday, today we have two images showing the reality of living in the trench system they were shown digging in the previous image. 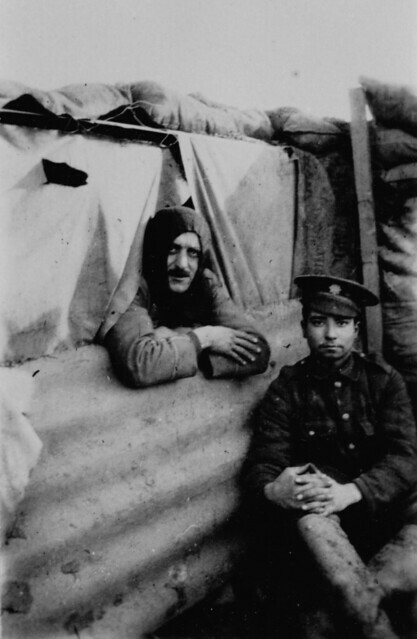 Above is a 1915-style dugout being used by men of the 13th London Regiment whose trenches these were. It shows how basic such constructions were in early 1915. 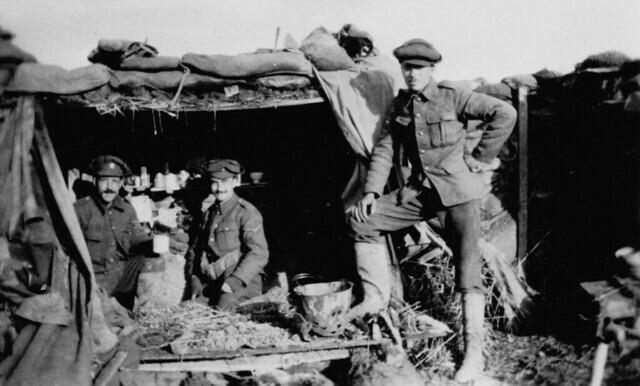 Inside the men have an array of comforts – many ordinary soldiers in this battalion were from well off London families and one wonders how many treats from top London stores are among them! – and they are pretty informally dressed; the man on the right has Wellington boots on and they are all wearing Gor Blimey hats. A bucket with punched out holes serves as a make-shift brazier. Below is a close up another dugout again showing its flimsy construction, with one wall being a propped up piece of wobbly tin or ‘elephant iron’ as it was known at the time. The Balaclava helmet being worn by the man in the dugout is a good example of another piece of cold-weather gear worn by troops at this time; many of these came from home knitted by mothers, wives or sisters. This entry was posted on 18/01/2012 by sommecourt. It was filed under BEF, British Army, France, Great War, Western Front, WW1 and was tagged with 1915, Dugouts, Great War, Kensington, London Regiment, Northern France, Trenches, WW1. I have been researching L/CPL H (Hugh) ‘Tug’ Wilson who is central in Eric Kennington’s famous work ‘The Kensingtons at Laventie’. The moustached, balaclava wearing gentlemen in 1915 looks exactly like the Tug Wilson in the painting.